The Global Volcanism Program has no activity reports for Mashu. The Global Volcanism Program has no Weekly Reports available for Mashu. The Global Volcanism Program has no Bulletin Reports available for Mashu. Mashu is a 6-km-wide Holocene caldera that truncates a stratovolcano constructed on the ESE rim of the large Kutcharo caldera. 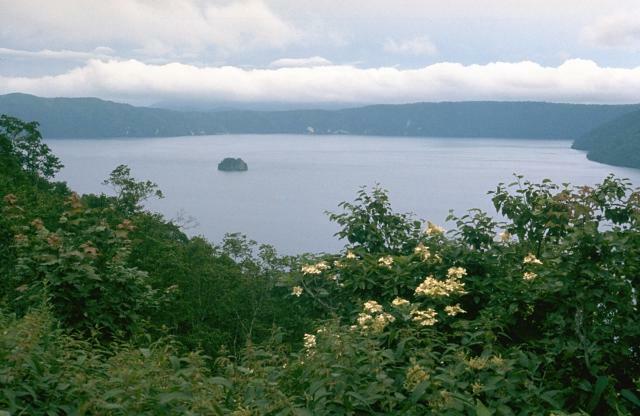 The steep-walled caldera, filled by the remarkably transparent waters of Lake Mashu, is one of the scenic highlights of Hokkaido. 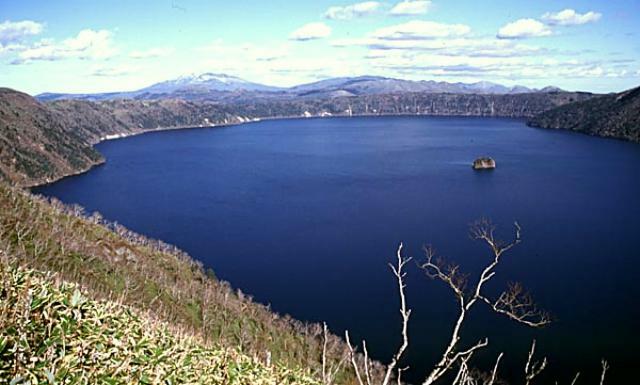 Following caldera collapse about 7000 years ago, a small andesitic stratovolcano, Kamuinupuri, was formed beginning about 4000 years ago, creating a reentrant into the SE side of the deep caldera lake. A large explosive eruption about 1000 years ago, the latest dated eruption, created a 1.2 x 1.5 km crater at the summit of Kamuinupuri. The small island of Kamuishu in the center of Lake Mashu represents the tip of a mostly submerged dacitic lava dome. Katsui Y, Ando S, Inaba K, 1975. Formation and magmatic evolution of Mashu volcano, east Hokkaido, Japan. Hokkaido Univ Fac Sci Jour, 16: 533-552. Kishimoto H, Hasegawa T, Nakagawa M, Wada K, 2009. Tephrostratigraphy and eruption style of Mashu volcano, during the last 14,000 years, eastern Hokkaido, Japan. Bull Volc Soc Japan (Kazan), 54: 15-36 (in Japanese with English abs). There is no Deformation History data available for Mashu. There is no Emissions History data available for Mashu. Kamuinupuri, its top in the clouds, is a small stratovolcano constructed on the SE rim of Mashu caldera. Growth of Kamuinupuri postdated the roughly 7000-year-old collapse of Mashu caldera. The steep scarp below the summit is the NE wall of a small, 1.2 x 1.5 km caldera that formed at the summit of Kamuinupuri about 1000 years ago, during the last eruption of Mashu volcano. 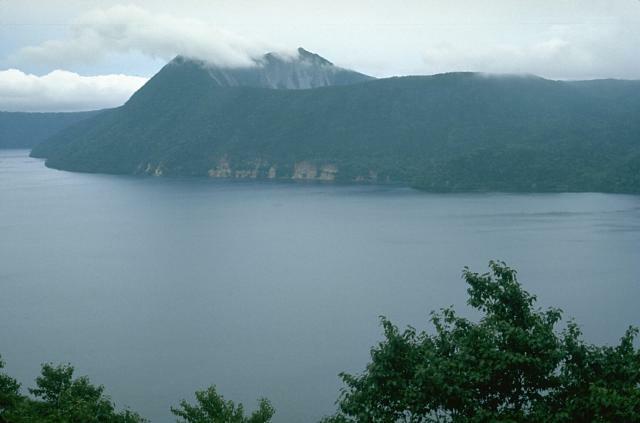 The deep blue waters of 6-km-wide Mashu caldera are seen here from its western rim. The small island of Kamuishu in the center of Lake Mashu (right-center) represents the tip of a mostly submerged lava dome. Mashu is a Holocene caldera that truncates a stratovolcano constructed on the ESE rim of the large Kutcharo caldera. Following caldera collapse, a small stratovolcano, Kamuinupuri (whose lower flanks are visible at the far right), was formed beginning about 4000 years ago. Copyrighted photo by Shun Nakano, 2001 (Japanese Quaternary Volcanoes database, RIODB, http://riodb02.ibase.aist.go.jp/strata/VOL_JP/EN/index.htm and Geol Surv Japan, AIST, http://www.gsj.jp/). There are no samples for Mashu in the Smithsonian's NMNH Department of Mineral Sciences Rock and Ore collection. Large Eruptions of Mashu Information about large Quaternary eruptions (VEI >= 4) is cataloged in the Large Magnitude Explosive Volcanic Eruptions (LaMEVE) database of the Volcano Global Risk Identification and Analysis Project (VOGRIPA).